It may only be a few years before Australians are consuming a high protein, semi-domesticated grain eaten by the Incas a thousand years ago. Pearl lupin (Lupinus mutabilis), a nitrogen-fixing legume very high in oil and originally from the Andes in South America, is to be developed for medium to high rainfall zones of Australia. Its name derives from the appearance of the lustrous, spherical, pearl-white seeds. A three year Grains Research and Development Corporation (GRDC) funded project, involving the Centre for Legumes in Mediterranean Agriculture (CLIMA) at The University of Western Australia (UWA) and the Department of Agriculture and Food WA (DAFWA), will focus on increasing grain yield and improving adaptation, with the ultimate aim being commercial release of a new variety. It builds on previous GRDC supported work on preliminary breeding, agronomics and germplasm evaluation by Dr Jon Clements of CLIMA and Dr Mark Sweetingham of DAFWA. CLIMA Director, Professor William Erskine, says Australian farmers presently grow narrow-leafed lupin as a nitrogen-fixing crop in broadacre farming rotations. “But broad-leafed pearl lupins are unique among crop lupins because the seed quality is similar to soybean and it could become the cool season equivalent of that crop. “Pearl lupins have the unusual combination for a legume of high protein, at up to 47 per cent and high oil at up to 18 per cent. A thin seed coat is an added bonus as it increases grain value and seed can be more readily dehulled,” he said. Pearl lupins also had a good profile of amino acids relative to other legumes, lysine levels are similar to soybean and the oil has high oleic and linoleic acid. “Traditionally eaten as a porridge with maize or quinoa, pearl lupins have potential for modern human diets in bread, sausages, cakes and yoghurt – in fact any food that soybean is currently used for,” Professor Erskine said. CLIMA’s Dr Clements will conduct the breeding work in partnership with project supervisor, DAFWA Senior Lupin Breeder, Dr Bevan Buirchell. “Rapid breeding cycles, combined with genotype by environment and germplasm characterisation and evaluation studies, will help us develop domesticated material with improved agronomic and disease resistance traits,” Dr Buirchell said. The project draws on useful germplasm from the Australian Lupin Collection held at DAFWA’s South Perth site. According to Dr Clements, the critical factors are yield and adaptation and therefore the project would evaluate lines in medium to higher rainfall regions in Western Australia and New South Wales. 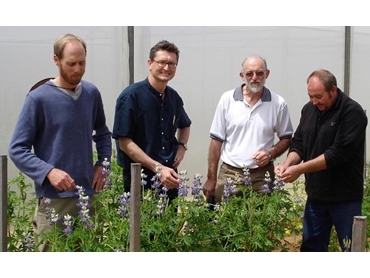 “Transferring the high oil and protein characters from pearl lupin to narrow leafed lupin (L. angustifolius) would be particularly valuable, if possible,” Dr Clements said. The group, assisted by CLIMA’s Gordon Francis, John Quealy and Dr Larissa Prilyuk, will also assess closely related South American species for possible trait transfer into the pearl lupin genepool. Professor Erskine said CLIMA’s ongoing collaboration with DAFWA in pre-breeding pearl lupins was a good example of how two outcome focussed R&D organisations could potentially deliver rapid and beneficial outcomes to legume growers.